effecting positive change in our nation’s rural communities. FIELD has helped approximately 30,000 low-skilled workers, rural Latinos and farm workers by giving them a chance to succeed through training and academic EXCELLENCE. Beyond the Fields-Farm Workers Excel Academically! EPIC de Cesar Chavez receives Western Association of School & Colleges (WASC) accreditation! View the February 21, 2018 KSACC- Notice for Public Hearing by clicking here. View the Public Hearing Notice for EPIC de Cesar Chavez's 2015-2016 Local Control and Accountability Plan (LCAP) by clicking here. View the 2015-2016 Local Control and Accountability Plan (LCAP) for EPIC de Cesar Chavez by clicking here. View EPIC de Cesar Chavez's 3 year Budget projections by clicking here. FIELD is renovating its Shafter Learning Center! This renovation is a prevailing wage project. View the proposed renovation project by clicking here. 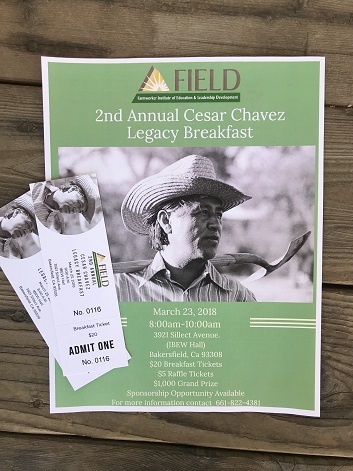 2nd Annual Cesar Chavez Legacy Breakfast! Recent immigrant farm workers have an average of 6th grade education with illiteracy rates as high as 21%. FIELD's Conservation Corps, our newest program, partners with Tejon Ranch Conservancy for valley community public access. FIELD's high school students participate in the first tour of 2012. EPIC de Cesar Chavez will be holding its 2016-17 high school graduation ceremonies in June, 2017. Please click here for days, times, and locations. Making a REAL difference to rural economic development! Click on each photo to learn the story of how we are making a difference for rural, low-skilled workers, farmworker families, and community employers. Become a volunteer: Join us to keep our programs strong. Become a sponsor: Help us expand nationally. Here is a link to a video about Cesar Chavez created by students for the History Day competition in 2014. It won first place in Kern County. Here is a link to a video clip from 23 ABC of one of our learning centers in Kern County.